At Red Barn Cabinet Co., we strive to provide our residential and commercial clients with the best experience possible, from design to project completion. With many years of experience in commercial projects, we've built our reputation for quality through the work we've done on numerous restaurants, dealerships, and dental offices. We work to improve our community's quality of life by providing our local businesses with beautiful, custom-made cabinetry work and value each and every relationship we've built and continue to build with our clients. As an independently operated business, our team of professionals are skilled in many areas and work closely with each client to understand what your goals are, and what steps are necessary to achieve them. No matter the size of the project, we will determine what steps should to be taken to complete the job on time and within the set budget. 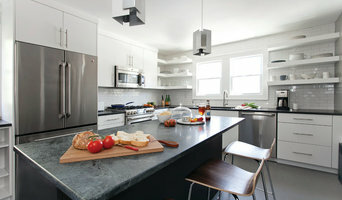 The Home Depot installs more kitchens than any other company. We have the best designers and installers in the business. Call and set a free consultation appointment with one of our four specialty designers that will fit your style with your budget and take care of your job as it works it's way through the system. With a BFA in Visual Communication you will see my design training shape your designs. After being in the professional woodworking industry since 1978, we have the experience to deliver a quality project that will last for many many years. Beginning with freehand sketches based on your descriptions, to line drawings before fabrication, we can produce the most accurate project available.